Challenge #15: Eat something you’ve never had before. First of all, I’m a few days late. I actually completed this challenge on Thursday, May 19. But due to some very busy days, I haven’t been at my laptop in a while. Second of all, anyone who knows me understands what a picky eater I am. Really, it’s pretty bad. There are just certain things I can’t and won’t eat. But I was a good sport with this… the problem was I had already promised myself a tostada from Cafe Rio for dinner and I had already packed my lunch. I thought I could get away with the fact that it was a child’s birthday at our child care program. Her mom brought in these amazing-looking cupcakes. I was pretty sure they weren’t store-bought. (The parents are only supposed to bring in store-bought treats.) But of course that didn’t stop me from eating one. Yes I’ve eaten cupcakes before, but never like these! I can’t even explain it! The outside was rather like a chocolate shell, and the only way I can describe the inside is to compare it to raw cookie dough. It wasn’t so much a tastebud conspiracy as it was a party in my mouth! So though I think I could get away with just that, I did actually decide to eat something I’ve really never eaten before. At Cafe Rio they make flan. Anytime anyone would ask if I’d like to order it and share it with them I’d say, no thanks – I don’t like flan. But the truth of the matter is I’d really never had it. It was just one of those things that I took one look at and decided I wouldn’t like it, so I wouldn’t try it. One reason is its name: flan. Sounds gross, bland, blah. Another reason is its texture. You can’t really tell texture just by looking at something, but it always looked spongy, but like a wet sponge. Ugh. But I went to Cafe Rio and I ordered it. There were two kinds, original and chocolate cheese. I went with the chocolate cheese because I figured it had a better shot at having flavor. 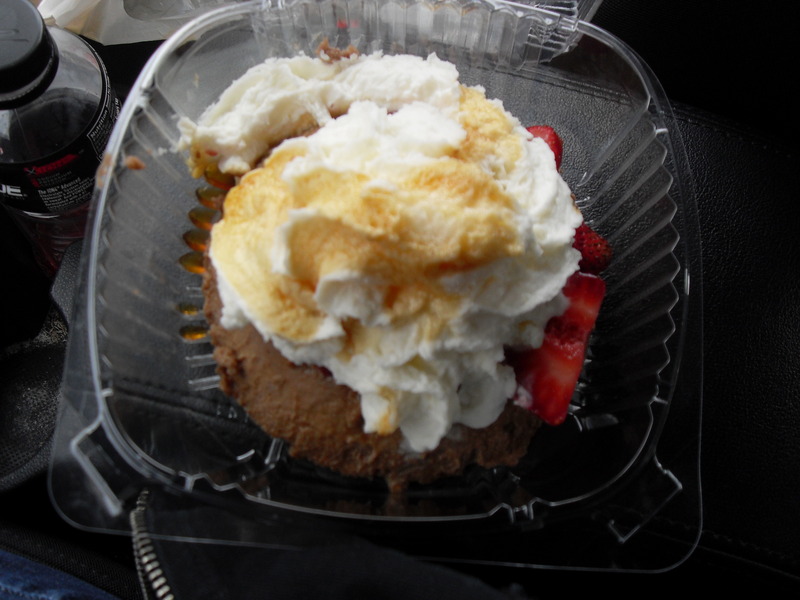 They put fresh strawberries, whipped cream, and some kind of caramel sauce on top. The verdict is in and… I kinda liked it. The texture did leave something to be desired, and it really could have used more flavor. But it was far from gross. The best bites were those with the strawberries. I ended up not eating all of it, but that’s probably a good thing for my waistline. 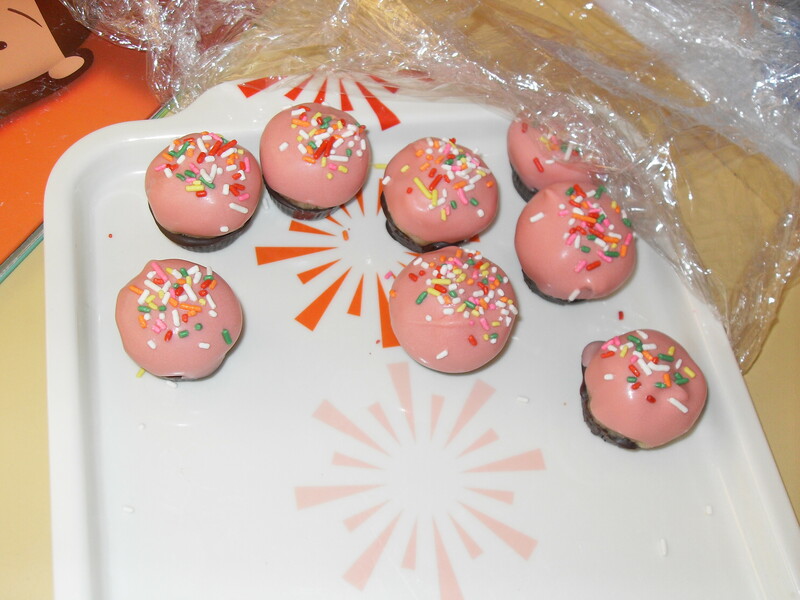 the cupcakes and cakepops made into mini cupcakes. i’ve made those exact ones. so no they weren’t store bought no way. you take a baked cake, smoosh it together with a can of frosting (cookie dough texture) and cover with melted chocolate. i can only eat one they are too sugary. and man i have never seen flan like that before, crazy but yeah the texture is something to get used to. but i’m very proud that you tried something new, because that is the best thing about food! Thanks Dawn, I knew you’d be proud of me!